NetSupport Manager makes remote administration simple. If you’ve ever been in the business of providing tech support, you most likely have your share of amusing (or frightening) stories of walking people through procedures over the phone. Because you can’t see what the user’s seeing, even something as simple as getting the user to click the Start button can be time-consuming. This is why NetSupport Inc. developed NetSupport Manager. 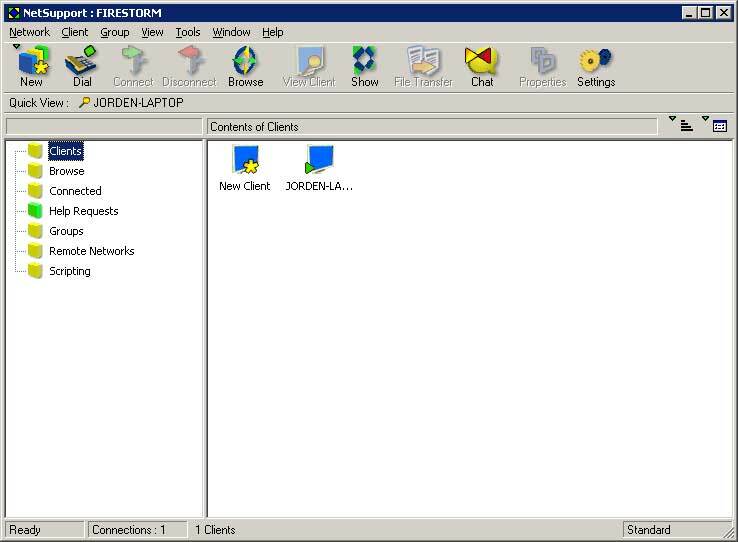 NetSupport Manager version 7 is a handy tool that not only allows you to see what users are doing, but allows you to take control of their systems and perform tasks for them. You may think this sounds like run-of-the-mill remote control software, but there’s more to this product. First, the remote control feature is lightning fast. I was controlling a machine over a 100MB/second network, and there was no delay between the machines. There’s also a handy function that allows the client machine to request help from a controlling machine. All users need to do is right-click the icon in the system tray and select Request Help. A message is then posted at the controlling machine the next time it connects to the calling machine. Another nice feature is the hardware and software inventory capability. Imagine never having to ask, “How much RAM does your machine have?” again. Just by right-clicking a system in the control program and selecting hardware or software inventory, you can get a complete listing of everything on the system. Manager also has a built-in scripting language that looks suspiciously like VBScript (but that’s good, as it makes it easier to learn). With this language, you can automate just about anything on the remote systems. There are only a few minor drawbacks to the software. First, the monitor blacks out for a second or so during installation. (I thought my machine rebooted right in the middle of installing, which was kind of spooky.) Second, the hardware and software inventories are referred to as separate functions, but they’re the same thing. Regardless of whether you select hardware inventory or software inventory, you get both. The final issue is that when you close the remote control window, you expect the controlling system to disconnect from the controlled system, but that isn’t the case, by default. You must close the remote control window, then disconnect from the client by right-clicking the client icon and selecting Disconnect. NetSupport allows administrators to take control of a client’s system and perform tasks for them. If you’re working for a small company just looking to control one or two machines, this software may be a little pricey, but if you’re in a large organization that really wants to streamline tech support operations, this is definitely worth investigating.